Mark Your Calendars – September! This 3-day fiesta comprises a series of exciting events, namely NMiEF 2010 Spotlight Conference, New Media in Education International Conference on Second Life and Innova Film Festival.NMiEF seeks to bring about greater vibrancy to the new media scene in the education context, firstly through fostering enhanced interactions among both local and international educators in a real-time virtual education conference on Second Life and secondly through raising awareness of the potential of new media for community involvement and social action among students through the launch of youthchaNgE 3.0.Check out the previous post with all the session details and times. September 14 – Have you registered yet for the Streamathon 2010? If not, check out the national blog for the list of awesome sessions! September 22 – DEN in Second Life kicks off autumn with a Wednesday concert by Harper Messmer who has been performing in SL since 2007. Harper has agreed to present a one hour concert of his music for the DEN. Blending pop, rock, and R&B into his musical arsenal, there is no doubt that you will find Harper Messmer’s music experience fun and entertaining. Come listen to his originals as well as his covers of Dave Matthews, John Mayer, Jason Mraz, Billy Joel, Lionel Richie, Michael Jackson, Maroon 5, James Taylor, One Republic, and many more. Please note: This concert will take place at an earlier time than our usual events. Look for additional reminders and in-world notices as the event approaches. Kick back with fellow DEN members, listen to great tunes, and pat yourself on the back for getting another school year underway! Thanks to GeeGee Zerbino and Telos String for getting this set up with Harper! Looking ahead to October, the DEN Virtual conference is on the horizon and we are hoping to have an in-person (in-world) venue for that jam-packed Saturday, October 23. 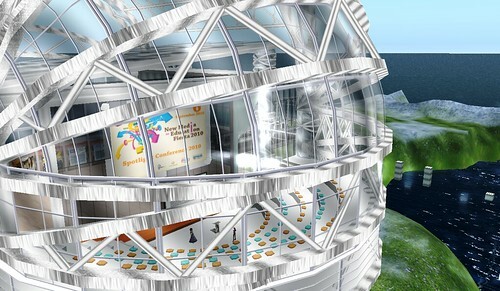 If you can’t get to a real world live event, then “go live virtually” in SL. More on that soon. And the end of October will bring…Halloween at DEN in SL. Stay tuned!